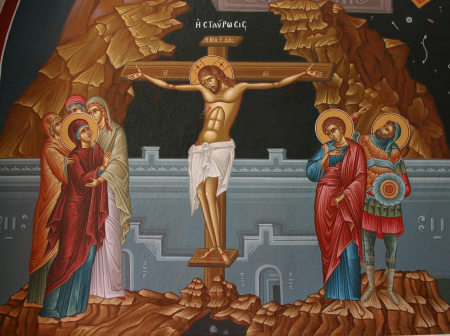 The Gospel reading for today, St. John’s Passion narrative (John 18:1-19:42) can be found here. Within St. John’s Gospel, the trial of Jesus looks a little like the Tower of Babel. Jesus and Pilate really aren’t speaking the same language, leaving Pilate with the haunting question, “What is truth?” While Pilate doesn’t know it, he’s about to hang the Truth up on a tree, like a scarecrow. Rather than seeking understanding, Pilate’s question actually constitutes a desperate sort of evasion. As Archbishop Rowan Williams has observed, “We constantly try to start from somewhere other than where we are.” Whatever Pilate wanted to know, it didn’t have much to do with the Truth. Within this trial, Jesus tells Pilate, “Everyone who belongs to the truth listens to my voice.” This passage echoes with Jesus’ earlier claim: “My sheep hear my voice. I know them, and they follow me. I give them eternal life, and they will never perish.” John 10:27-28. Good Friday, then, operates not so much as a historical marker as a beacon in the darkness, calling out for us to remember, to belong to the truth and listen to Christ’s voice. The crowd then makes a monstrous barter, condemning Jesus and allowing Barabbas to go free. I sometimes wonder what Barabbas did with the balance of his life, how he spent his remaining years. Did this “bandit” come to comprehend what had happened? I also wonder whether we, like Barabbas, understand that Jesus’ death means that we can live, and will never perish? Pilate then has Jesus whipped, and Jesus returns before the crowd in a purple robe and a crown of thorns. While Caesar wore a laurel wreath, we wince at the idea of this twisted symbol of Jesus’ kingdom. After a Roman scourging, Pilate mocks Jesus and the crowd, telling them “Here is the man!” (Ecce homo!). The suggestion that this broken, frail, bloody person could be a king was laughable. The soldiers mocked Christ by calling him “The King of the Jews.” As usual, John places words of deep truth within the mouths of those who don’t understand what they’re saying. The trial results in Jesus’ inevitable condemnation, and He carries his own cross to the Place of the Skull (Golgotha). Even in this final hour, the world mocks Jesus under a sign bitterly describing Him as the King of the Jews. Jesus says “I am thirsty” and is given a sponge soaked in sour wine. Here,we encounter St. John at his most ironic, at his most paradoxical understanding. In this moment of shame, unbearable pain, and within this passion, God reveals His glory. When Jesus spoke of being glorified, somehow, this is the moment He meant. Jesus tells his mother that the beloved disciple is now her son; he tells His beloved follower that Mary is now his mother. Just as He had done in life, in death, Jesus re-defines the nature of “family”. Squarely confronting His own mortality, Jesus establishes a new notion of kinship (into which we all are adopted). Finally, after a day filled with countless agonies, Jesus announces “It is finished.” Through the life and death of Jesus, God’s glory has been fully made clear. Somehow, this broken, pathetic figure wearing a crown of nettles manifests “glory.” Nailed to the cross, we find glory in the intersection of divinity and humanity, the intersection of light and darkness, the intersection of life and death. God has shown us the final consequences of our brokenness and of our hatred. Through it all, He has managed to reveal divine love despite everything we could do to avoid it. His capacity to love and forgive always infinitely surpasses our capacity to wound, our capacity to destroy, and our capacity to distance ourselves from the Living God. This entry was posted in Uncategorized and tagged Anglican, Bible, Disciple, Bible, Christianity, Crucifixion, Death, Disciples, discipleship, Dominican Order, Episcopalian, Good Friday, Gospel, Jesus, Lent, Love, Mary, Moral Theology, Pilate, Religion, Rowan Williams, Salvation, Scripture, Spirituality, The Kingdom of God, Theology, Trial of Jesus. Bookmark the permalink. This is something which came to my mind as I read your post, Brother James. Pontius Pilate and people like him who did not seek the truth helped to fulfill God’s plan to save us all. I wonder if these people searched for and found the truth after Jesus’ resurrection and their having had a part in Jesus’ death? It’s my great hope that they did, at some point, find the Truth. Yes, and we feel a certain tension between the kingdom that we know is yet to come and the kingdom that is already here. Thanks, Brother. You nourish my soul. Have a joyful Tridium. I’m so glad you like the blog. You’re very kind and have always been terribly supportive. Love the Rowan Williams quote…will file it for future use! He’s a pretty rich source. It’s from a book called Christ on Trial, which i really recommend. that my kingdom is not of this world comnemt must have blown pliates mind. aliens? other worlds? Jesus is so unconcerned with himself and his body because he knows his kingdom is yet to come. I think it would have confused Pilate seriously. I think it may still confuse many of us today. Jesus know his Source, and did not stray from it. I hope it’s so with us.